If you’re a regular reader of this site, you know that ordering a Kopstootje, Dutch for “little headbutt,” will get you a tulip glass of genever and a glass of beer. Typically the beer would be a simple lager, but here in Portland we took the idea further by collaborating with the local Upright Brewery to create a beer specifically designed to pair with Bols Genever, Upright Kopstootje Biere. This lightly spiced biere de garde has been a hit two years running, but if you haven’t been in Portland to catch one of the fewer than twenty kegs produced each batch then you’ve had no way to try it. We enjoyed this collaboration between distillery and brewery so much that we decided to bring it to more cities. To do that we’ve partnered with another rock star brewer, Brian Strumke of Stillwater Ales. Brian set out to create his own perfect match to Bols Genever. His Stillwater Artisanal Kopstootje is a saison-style ale made with barley, rye, wheat, and corn, spiced with botanicals to complement the spirit. Brian is a gypsy brewer who travels the world making unique beers, so I can’t wait to taste what he’s come up with. Beginning later this month, we’re kicking off a seven-city tour to launch the pairing. We’re starting in New Orleans, then working our way up the East Coast, and finally wrapping up in Chicago. All events are open to the public, so please stop by and order a Kopstootje. I’ll personally be at the events in New Orleans, DC, Chicago, and probably Boston. Lucas Bols Master Distiller Piet van Leijenhorst will visit in New York. Brian from Stillwater and Tal Nadari from Lucas Bols will be attending events as well. Below is our current schedule of events, which I will update with dates and times as they become available. I hope to see you there! Monday, 2/27 at Cure, 5-7 pm. Monday, 2/27 at Bellocq, 11 pm – late. Tuesday, 2/28 at Avenue Pub, 6 pm. Wednesday, 2/29 at Ten Ten. Monday, 3/5 at Farmer’s Cabinet. Wednesday, 3/14 at Bangers and Lace. Wednesday, 3/14 at Three Aces. 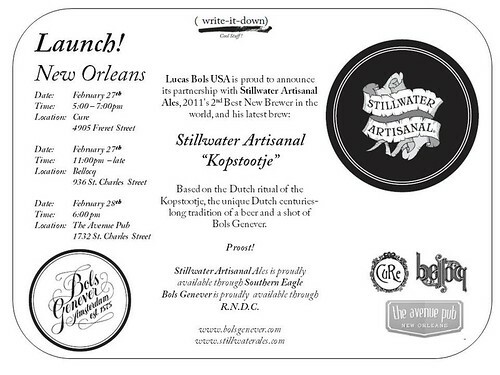 I’m headed back to my hometown today for the launch of Bols Genever in Houston. For industry and media, we’re hosting an event at Anvil Bar and Refuge from 1-3 tomorrow (Wednesday); contact me if you’d like to attend. Then for the rest of the night Anvil is offering a menu of cocktails featuring Bols and Galliano for anyone who’d like to stop in. On Thursday I’m guest bartending with Mindy Kucan at Grand Prize Bar. This should be lots of fun, with Bols cocktails, kopstootjes, and even a frozen Harvey Wallbanger. That will run from 4:30 till 7ish. If you’re in Houston I hope to see you at one of these events! Upright and Bols introduce Kopstootje Biere! It’s been almost a year since I started working for Lucas Bols and I’m not going to lie, I’ve gotten to do some fun things on this job. However none of them is more exciting than the project we’re releasing tomorrow, a collaboration between Bols and Upright Brewing to create the perfect pairing of beer and spirits, the Kopstootje Biere! The Kopstootje, or “little headbutt,” is the Dutch version of beer and a shot. A tulip glass is filled to the brim with genever and served with a beer back. Since the glass would overflow if moved, the drinker takes the first sip by bending down to take the first sip off the top and then following that with a sip of beer. It’s a surprisingly good match, with the maltiness and botanicals of genever complementing the malt and hops in beer (Bols Genever actually includes hops as one of its botanicals). A crisp lager would be the usual choice of beer for a Kopstootje, but Oregon is better known for its hoppy ales. 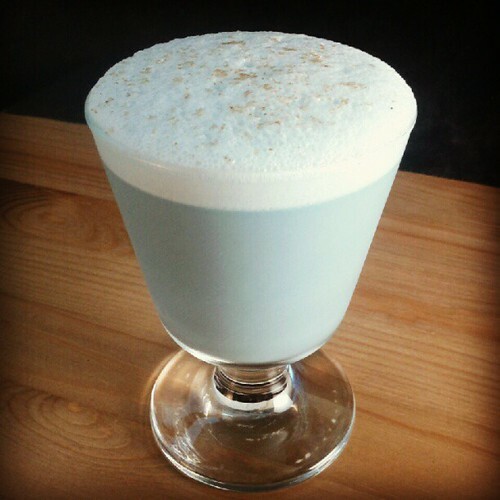 So my boss, Tal Nadari, suggested approaching one of Portland’s many local breweries about coming up with a Portland twist on the traditional Dutch drink. I knew right away that Upright is who I wanted to team up with; their farmhouse ales are among my favorite beers and brewer Alex Ganum loves taking on experimental brews, from oyster stouts to sour ales aged in Pinot Noir barrels. Alex also loved the idea of creating a beer designed specifically to par with Bols Genever, so I was thrilled that he decided to collaborate with us. A few weeks later Alex, fellow Upright brewer Gerritt Ill, and I say down to taste genever and plan the beer. Alex decided on a biere de garde. This a rustic French beer that uses lager yeasts fermented at warm temperatures, fitting into Upright’s farmhouse style. Yet Upright’s beer diverges from the traditional with the addition of many of the same botanicals that go into Bols Genever, including aniseed, ginger, angelica root, licorice, and juniper berries. The result is a dry beer with subtle notes of spice. The beer came out just like we hoped it would and perfectly lives up to its name, Upright Kopstootje Biere. We’re holding a release party for the beer tomorrow, April 1, at Circa 33 in southeast Portland. Tal, Alex, and I will be on hand and we’ll have $6 Kopstootjes on offer from 5-8. If you can’t join us then, we have a small number of kegs going on tap at some of Portland’s best bars and restaurants: Beaker and Flask, Broder, Clyde Common, Cruz Room, Grain and Gristle, Hop and Vine, Irving Street Kitchen, Spirit of ‘77, Spints Alehouse, St. Jack, and Temple Bar. Get your Kopstootje Biere before it runs out! Apologies for the light posting last week, I’ve been hard at work with my new job and preparing for a few fun events coming up in Portland. First up is tonight’s Taste of the Nation event benefiting Share Our Strength. I’ll be there not as a mixologist but as a magician. This will be my first public performance since moving to Portland. Tickets are still available and there are lot of great restaurants involved, so there are plenty of reasons to come aside from watching me drop cards all over the floor trying to do tricks I haven’t done in years. Then on Wednesday we’re celebrating Bols Genever’s Oregon launch with a punch party at Clyde Common with Jeffrey Morgenthaler. We’ll have two giant bowls of Bols punches out from 4-6 pm. Come join us for what’s sure to be a fun evening! 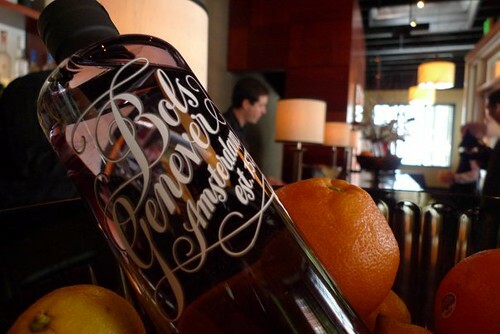 On Monday Carlyle hosted the Oregon launch event for Bols genever. Genever, the predecessor to the old tom, London dry, and Plymouth styles of gin that eventually took hold in the United States, has until recently been extremely hard to find here despite its continued popularity in parts of Europe. Mixologists seeking to replicate 19th century cocktail recipes have had to resort to desperate measures like blending Irish whiskey, Plymouth, and simple syrup to approximate its flavor in cocktails. Needless to say, having a real genever in wide distribution is a welcome development. The juniper flavor in genever is much less aggressive than in London dry. Malt notes from the grain instead take center stage. It mixes differently than junipery gins, which can be a challenge if you try to treat it like one (though it does make a nice Collins). David Embury, for example, didn’t know what to do with it. “Holland gin does not blend well with other flavors and, while dozens of recipes have been written for Holland-gin cocktails, they are generally regarded (and properly so) as pretty much worthless,” he wrote in The Fine Art of Mixing Drinks. This is more a failure of imagination than of the spirit. Treating it more like a whiskey than a gin can lead to some great results. One of my favorite drinks we served was a simple genever Old-Fashioned, made with Bols, superfine sugar, Jerry Thomas’ Own Decanter Bitters, and a slice of lemon peel. It’s delicious. Other bartenders at the event tried substituting it for rye in variations on the Vieux Carré and Remember the Maine, both of which showed promise. There’s a lot of unexplored territory here and I expect we’ll be seeing innovative genever cocktails showing up on many local cocktail menus soon. Stir over ice and strain into a chilled coupe. The bitters tie this drink together, offering lots of flavor affinities: chocolate and malt, chocolate and orange, chocolate and Chartreuse. I’ll be adding it to the menu at Carlyle later this week. The name, by the way, isn’t a reference to Milhouse Van Houten. Bonus points if you know who it is a reference too, especially if you can name him without Googling.